Ayn Rand (1905–1982) was a novelist and philosopher. She produced several successful libertarian-themed novels and created a philosophy called Objectivism. Her educational writings stressed that, as a state enterprise, public education was ill-equipped to teach the kind of individualism and rational thinking on which a free society depends. 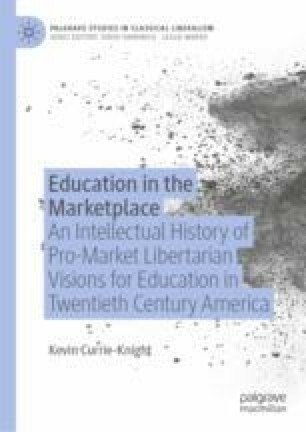 Private markets in education were preferred, among other reasons, because they were thought more likely to equip individuals for a free and rational society. Rand supported a role for government in education limited to giving tax credits to individuals for the purchase of education.